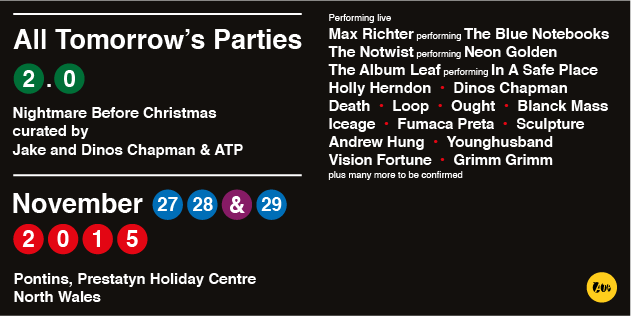 ATP, ‘Nightmare Before Christmas’, announces new acts, check it out! All Tomorrows Parties: Nightmare Before Christmas is set to return this November, curated by the Turner Prize nominated Chapman Brothers; it takes place at the new site of Pontins in Prestatyn. Joining the likes of Courtney Barnet, Iceage and Max Richter are Thee Oh Sees, Natalie Prass, Om, Jessica Pratt, Chelsea Wolfe, Pharmakon, Xylouris White, Russell Haswell, Empty Set, Extreme Precautions, Helm, Warm Soda, Avec La Soleil Sa Bouche, Föllakzoid, Warm Graves, Dead Rider,Dan Friel and VaticanShadow. ATP 2.0 Nightmare Before Christmas takes place in Prestatyn North Wales 27th-29th November, get your tickets here.